Here are the recommended bracket picks with Villanova beating Virginia 61-59 in the title game. After the bracket see explanations and 8 other methods for making picks (none of Wednesday's injury upsets should change picks due to strong back-ups as Houston's VanBeck 2.34 Value Add and IL-Chic's Dixson 0.00 are out, while Kansas' Azubuike 6.53 is questionable). We covered Hunter Tuesday by updating injuries here. Three years ago the Washington Post noted I rated Justin Anderson as indispensable to UVa's run, but this year they are deep enough to potentially make the run with Hunter out. See Injury Updates from Tuesday 11 p.m. which results in adjustments below. Injuries to Miami, Duke, UNC, and Virginia could result in extra wins for Loyola, Michigan State, Michigan/Gonzaga and Kentucky/Arizona (respectively). However, variations listed in the other numbers under each heading of the table project Arizona and Ohio State to join the Final Four if it comes down to the best dominant three-player comb on the court (third number left of each team by each team). If it comes down to the most NBA talent (fourth number left of each team) then Duke over Kentucky could follow a Final Four with Villanova and Gonzaga. Michigan is the hottest team (third number from the far right), and Kansas has the best-experienced guard play for a Final Four run (2nd column from the right). The main system clinched a victory over President Obama's (who knows his basketball) last bracket by the Elite 8 in 2016. In 2017, the Value Add All-Americans hit the 99th percentile by picking the Gonzaga vs. UNC championship game. That being said, the 2015 bracket was a disaster, and everyone from Nate Silver to the casual fan knows that one of the many fans who take wild guesses will stumble onto wins that neither Nate, me or any basketball expert would logically choose. 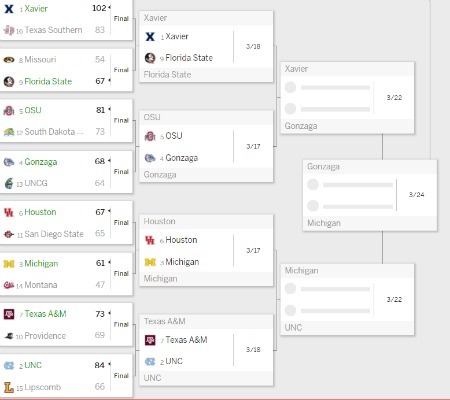 Here is the story at John Dodds' 247 sites for CBS Sports as we unveil the bracket predictions at the top of this blog. While some have credited following my picks for winning their brackets, I accept no responsibility for anyone following these picks and being destroyed in their pool :-) Like a stockbroker warns - past results do not guarantee future performance. Nonetheless, here is the comprehensive breakdown of the factors we consider and the links to further explanation on each. 1. Value Add adjusted for Injuries/Returning Players (2nd column) - By far the most important single factor is ... how good the team on the floor is today. 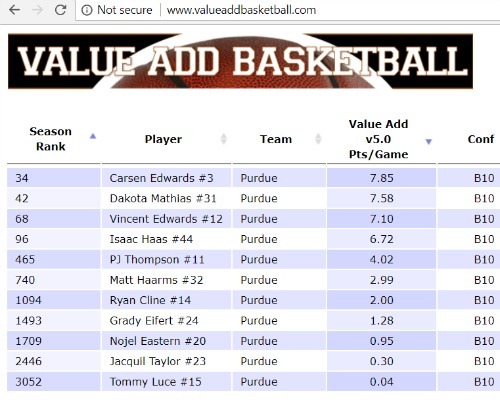 This starts with a fraction of the www.kenpom.com rating and uses Value Add to increase that rating for returning players (e.g. Michael Porter Jr. for Missouri) and subtracting for players injured with strong replacements (Auburn, Clemson, and Nevada hardest hit). Based on this the final would be Virginia over Villanova with UNC and Duke in the Final Four. a. Upsets (5th column left of the team). This is a variation on above, except it takes a chance on the worse seed whenever they are within one point of the favorite in the Value Add Adjusted for injuries. Villanova over Virginia with Duke and Michigan in the Final Four. 2. NBA Talent. (4th column left of the team) Duke over Kentucky, with Villanova and Gonzaga in the Final Four. 3. All American/Top 3 dominant players (3rd column left of the team). See also the original All-American Announcement). Villanova over Arizona with Duke and Ohio State in the Final Four. 4. Upset Mismatches. (6th column left of the team) Chances for upsets due to one of these three areas of mismatches; Three-point Shooting, Steals or Offensive Rebounding. A lot more first-round upsets, but still Virginia over Villanova with Duke and UNC in the Final Four in the end. a. Coaching (furthest column right). Villanova over Virginia with UNC and Duke in the Final Four. b. Experienced Guards (2nd column from right). Virginia over Villanova with UNC and Kansas in the Final Four. c. Hot Teams (third column from right). Virginia over Villanova with Duke and Michigan in the Final Four. 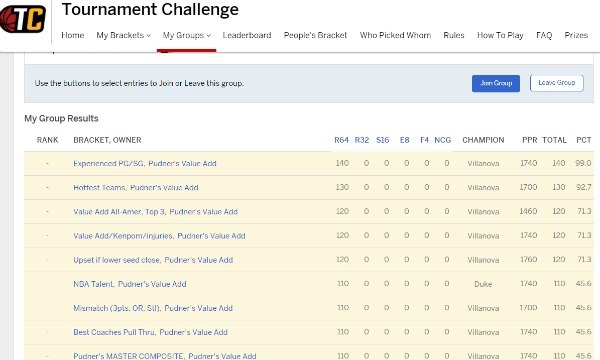 To go beyond the Final Four scenarios spelled out by each method, the number by each team in each scenario indicates how many times you should write in the team name. For example, the top team listed Virginia is either the National Champion (6 lines) or Runner Up (5 lines) in all but two scenarios. In these two scenarios, Virginia would lose after two games to either Arizona or Kentucky. If it comes down to the most dominant trio on the court they would lose to Arizona (whose top three players are better than Virginia's top three players), and if it came down to the most future NBA talent dominating then they would lose to Kentucky after two wins. The final factors to consider when filling out your bracket are the experience of the team's coach in making NCAA runs, if they have upperclassmen point guard who can steady the team under the pressure of the tournament, and if the team closed the season playing well or not. The first three numbers left of the team gives the prediction of how many games they would win with an emphasis on any of these three areas. The first number (Hot) is based on how many they would win based on how "hot" they are which corresponds to the movement in the team's KenPom rating since Feb. 1. Virginia projects as the national champion (6 lines) based on their overall top rating plus being hot as they moved from 2nd to 1st in KenPom. The second column (PG/SG) is wins adjusted for the experience of the Point Guard (primarily) and the Shooting Guard (secondary). Virginia projects as the National Champion under that scenario as well, with their Point Guard Hall (senior) and shooting guard Guy (sophomore) getting a "7 of 10" for the experience. The third column (Coach) projects Virginia being nudged out by Villanova. Virginia has small edge over Villanova overall, but Jay Wright has gone further than Tony Bennett so far with the national title two years ago, so Villanova gets a slight advantage on this category. (Marquette Note: Andrew Rowsey's status as a senior point guard (6 points) and Markus Howard's as a sophomore shooting guard (1 point) gives Marquette a 7 of 10 rating on the experienced backcourt. That would project to be a big enough gap to shift one regoinal match against a 6-seed (Miami with freshman point guard Lykes and sophomore shooting guard Vasiljevic) for a win. Since February 1 Marquette dropped from 50th to 53rd to rate as slighly cold, and Coach Wojo's inexperience would not have provided a win based on either of those two categories). Al McGuire said a team needed three-and-a-half stars to win a championship. It is hard for us to measure the hustler who can be the third star, but sometimes the team with the most dominant All-American level player on the court or a team with three great options as stars can beat more balanced teams with a longer bench during March Madness. The Value Add All-American list was the most accurate last year, and if that happened this year it would be Villanova over Arizona in the title game - who feature the two most dominant All-Americans in the tournament and the most dominant trio. 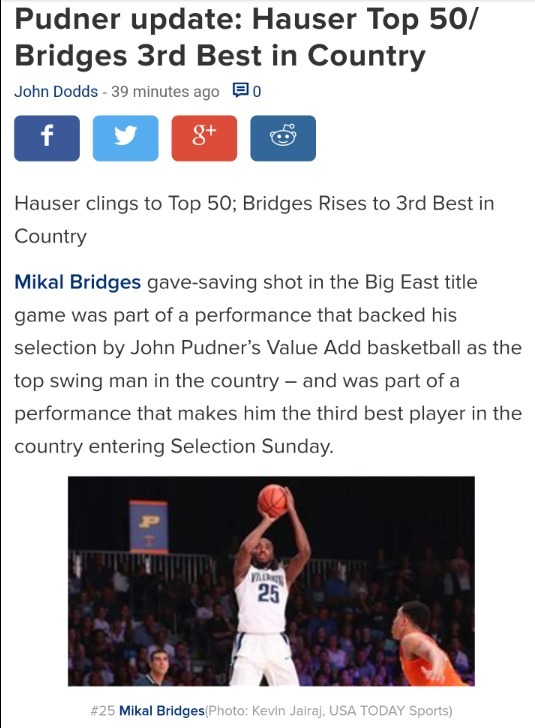 Villanova (26.98 Value Add of top 3 stars) is led by the 1st team All-American swingman Mikal Bridges (10.75) and just missed a second All-American in the close race between four point guards including Jalen Brunson (11th best in the country, 9.59 Value Add). Omari Spillman (6.64, 109th of more than 4,000 players) gives Nova a third player in the top three percent of all players. Arizona (24.63) is led by the only player in the tournament more dominant than Bridges this year - center Deandre Ayton (11.64 Value Add) who scored over 30 points in consecutive Pac-12 games to surge into 1st at www.valueaddbasketball.com. Arizona was the only team with two All-Americans Allonzo Trier, though he fell off slightly during the conference tournament. They then have the unbelievable luxury of a second dominant seven-footer who can be on the court at the same time as Ayton in Dusan Ristic. 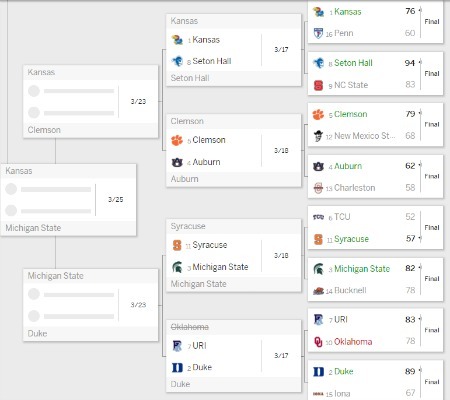 The other Final Four teams under this scenario would be Ohio State (All-American Keita Bates-Diop, 114th ranked Kaleb Wesson and 218th ranked Jae'Sean Tate) and Duke only team with three players in the top 1% in Marvin Bagley, Wendall Carter and Grayson Allen). The college basketball world spent half a season wondering, "Is there any way to stop Trae Young," and now the same people are asking, "Is there any way to stop Deandre Ayton?" While Young led the www.valueaddbasketball.com ratings most of the year with his Steph Curry-like range and release for Oklahoma, it has been Arizona's Deandre Ayton who shows an amazing skill set at 7-foot-1 en route to the Pac-12 title and taking over the No. 1 spot with an 11.64 Value Add as of Selection Sunday. You can go to www.valueaddbasketball.com to see the values of all 4,000 players, and most importly who good the top three stars are on each team - which is the basis of a teams "All-American" projection for wins in March Madness. Here are the top 50 plus some stars who were also named All-American but in some cases had their Value Add held down because of injuries. We focused another post on the chance that a team can score a March Madness upset by dominating a favored team via Offensive Rebounds (OR%), Steals (Stl%) or 3-point shorts (3PM-3PA). For these top stars we added their figure from www.kenpom.com for these three states, while the number between their name and team is their Value Add - or how many points a game they are worth beyond a replacement player. The late-breaking injuries wreak havoc. 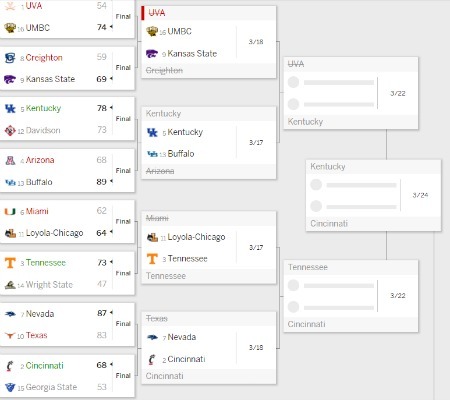 In the bracket based on Value Add and Health/Injuries Virginia drops to a projected runner-up (5 wins) and in the "slight" upset bracket down to 3 wins as either Arizona or Kentucky could easily beat them now in the Sweet 16. De'Andre Hunter has a 5.93 Value Add and despite some solid backups, being replaced by the 8th best player leaves Virginia 4.0 points worse. Kentucky also has a potential injury in Jarred Vanderbilt, which would cost them half a point, but we just take half off for a player who just misses. That actually nudges them below Arizona, but Kentucky is so close that if we go with slight upsets for a worse seed that is close then Kentucky beats Arizona and Virginia. Dropping half of the three potential injuries for Duke and UNC could create Final Four runs for Michigan State and possibly even Michigan. The team Value Add Ratings at the end of the season indicate how many points a team is better or worse than average. We have the raw Value Add, and then the injury adjustments to add for returning stars like Bonzie Colson (Notre Dame) and Michael Porter Jr. (Missouri) as well as players that were lost. This is the most important rating for determining bracket picks - who has the best team on the floor right now based on their season-long value adjusted for current personnel changes. All teams that were still alive Saturday evening, because they were still in their conference tournament or because they are viewed as in the tournament or on the bubble, are listed. First, here are the brackets you would use if you stuck with this, the most important factor - how good is the team right now. Virginia is the best team right now, a healthy team with a 21.7, so they would logically be the most likely to win the title. 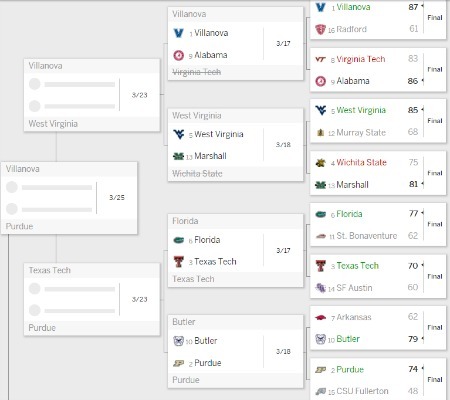 However, because it takes picking some upsets to have a chance to win, we do a second bracket that takes the worse seed if they are within 1 point in this important rating - for example, Villanova is within one of Virginia so we give them the title in the "Take upsets in tight match-ups." The teams with the most damaging injuries were Nevada, Auburn, and Clemson - but ironically Auburn would play Clemson in the second round. The team helped the most was Missouri with the return of Michael Porter Jr. to take them to another level. Notre Dame would have been the other team helped to that degree as the 15th best team in the country adjusted for Colson's return (11.4+3=14.4), but they lost their spot in the tournament when Davidson stole a bid. And here are the overall rankings of the final 91 teams competing for bids and notes on how much a player's injury or returning player helped or hurt their strength as of Selection Sunday. 14 Missouri 10.5 4.0 14.5 No. 1 NBA draftee Michael Porter Jr. is back. 15 Notre Dame 11.4 3.0 14.4 D.J. Harvey (knee) is out for the season but the return of National POY candidate Bonzie Colson back. 19 Kansas 15.4 0.0 15.4 If Udoka Azubuike not back, then -2.0. 23 Miami FL 10.7 2.0 12.7 If Bruce Brown not back then -2. 30 Creighton 11.8 -1.0 10.8 Martin Krampelj ACL is out for season. 35 Auburn 14.1 -3.0 11.1 NBA prospects Purijoy and Wiley,Auburn 2-4 w/oAnfernee McLemore. 37 UCLA 10.1 0.0 10.1 Ikenna Okwarabizie Concussion indefinite. 39 Nevada 13.0 -3.0 10.0 L. Drew was 4.50 Value add. 42 TCU 12.9 -3.0 9.9 Jaylen Fisher (5 value add), RJ Nembhard Ankle. 44 Clemson 13.8 -3.0 10.8 01/22/18 F Donte Grantham ACL is out for season, may be biggest loss of any team. 45 USC 10.2 -0.5 9.7 Good backups for Bennie Boatwright. 46 Texas 10.6 -1.0 9.6 Andrew Jones (5 value add) and Eric Davis 2.5. 47 Texas A&M 11.5 -2.0 9.5 Wilson 2.0 VA, Caldwell 1.0. 50 Syracuse 9.2 0.0 9.2 Thorpe, Washington out. 55 Maryland 10.0 -1.0 9.0 Bender, Jackson out. 60 Penn St. 11.6 -3.0 8.6 Watkins, Knee, worth 7.0. 68 Bucknell 4.6 -0.4 4.2 Newman Suspension. 80 Wright St. 1.9 -1.0 0.9 Justin Mitchell 2.4 out indefinitely. 85 Georgia Southern 1.2 -2.0 -0.8 03/10/18 F Montae Glenn Knee is out indefinitely.